UrbanMinx.com, is a a fabulous online clothing boutique that offers high-quality designer clothing at contemporary prices (which is code for discount). Now, who doesn't love a discount. 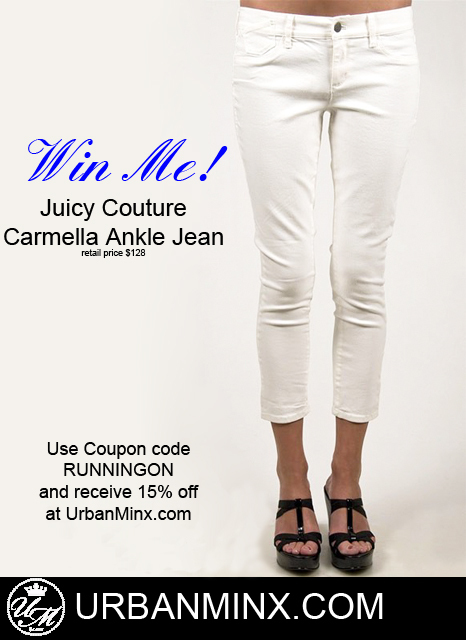 Lucky for you, Urban Minx is offering you the chance to win these lovely Juicy Couture ankle jeans, that carry a retail value of $128! Ummm, yes please! Aren't they perfect for spring and summer? I want to pair them with this or this. Like UrbanMinx.com on Facebook and leave a comment that Katie sent ya'. Your chance to win these ends on May 31st. Leave a comment below telling me what you did. Separate entry for each! Take advantage of the 15% off coupon code UrbanMinx is offering! Just enter RUNNINGON at checkout! Oh and one last thing, I'm also guesting on Work Your Closet today! Go chex it out after you've entered the giveaway! Happy Friday! 1.Like UrbanMinx.com on Facebook and left a comment saying that Katie sent me. I liked UrbanMinx and left a comment. I'm following UrbanMinx on twitter as tgiebult. Ah! I have bee searching for a pair just like this! Would love to win them! I liked UrbanMinx.com on Facebook & left a comment that Katie sent me! I'm following @UrbanMinx on Twitter now. I liked Urban Minx on Facebook & left a comment and linked to you in my comment on her page! I liked UrbanMinx.com on facebook and left a comment. I'm now following them on twitter and on UrbanMinx.blogspot.com. I love these ankle jeans! Hopefully I win. Katie, I can't tell you phow fabulous I think you are considering that you are moving, you changed the font on your blog(bee-you-tee-fill), and you are guest posting. Wow, you inspire me. I'm crying. -Liked Urban mix on fb and commented on their blog. -Follow Urban mix on twitter @daer0n. hit the follow button on twitter for Urbanminx. I follow them on twitter! thanks for the giveaway! You changed your theme on your blog. I like it! Did you do it on your own? How did you spice it up? Love it! Wow...LOVE, LOVE JUICY!!!! They are my favorite brand ever...these pants are hot! Thanks for hosting such a lovely giveaway and for the chance! Following you on Twitter (@BrideBlu). Loved your guest post. Pretty funny. You don't really seem like the kind of girl that would spill something a lot though! Maybe if I ever meet you I should steer clear? Hehe. Love the dress! Very pretty. And love how it's paired with the belt. You blog has shown me how utterly un-stylish I am! But I'm learning from you! Oh those are so cute! I just did the BEST Irish Jig you've ever seen... I also 'like' Urban Minx on FB!! I like UrbanMinx on Facebook! I follow UrbanMinx on twitter! I'm pretty sure these ankle jeans will long on me! so I can wear them as regular jeans! I have been looking so long for cute white jeans, these would be perfect! Thanks for the giveaway, such cute jeans! Liked them on Facebook, Twitter and followed the blog! I also just did a little Irish jig, because I'm so excited for the opportunity to win these gorg white ankle jeans!! Those white crop jeans are perfect for summer! I am following on twitter and 'liked' them on facebook! I'm following urbanminx on their blog. Liked on FB. I have totally been on the hunt for some white summer denim...so fingers crossed! Follow me on bloglovin' and comment saying you did and then I'll follow you back. and i followed them on twitter! thanks for the giveaway! I liked UrbanMinx on Facebook and left a comment. I Liked UrbanMinx.com on Facebook and wrote that Katie sent me. And I did a lovely Irish Jig. "Like" UrbanMinx.com on Facebook and left a comment! Also did an Irish Jig, lol! love these pants! i liked them on fb! definitely tried on a few just like this last weekend...want! i also followed their blog. and i so danced the irish jig! 1.Liked UrbanMinx.com on Facebook and left a comment that Katie sent me. Liked UrbanMinx.com on Facebook and left a comment that Katie sent me. Did my best Irish jig! I'm following UrbanMinx; those pants are to die for!! Liked them on FB and said Katie sent me! Followed and posted on facebook! Did an Irish Jig! Okay, it was more like an awkward shuffle. And the people in my office may have looked at me strangely. But it still counts, right? I followed them on blogspot! Consider items 1 through 4 done!! The jig was my favorite! Def following :) great giveaway!